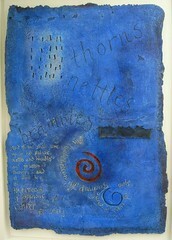 Jill’s art blog. One artist’s life. Coming up this week is the unexpected opportunity to have some work in the July exhibition – on mixed media art – in the gallery’s Eye to Eye section. As life has been ultra busy in other respects, it’s fun occasionally to do something at short notice and with little fuss. An Habitation of Dragons, which incorporates some evocative poetic text from Isaiah, is probably the bluest piece I have ever undertaken. The colour was built up with many washes of acrylic paint plus pure pigment. The support is a piece of specially cast cotton paper which contributes to the luminous effect of the colour. This entry was posted in All on June 30, 2008 by Jill. The best month to have garden sculpture on show – if only it doesn’t rain! 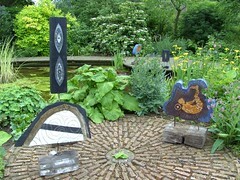 Twenty-five of my outdoor pieces using recycled materials are on show in the glorious gardens at Hall Farm, Harpswell, Lincolnshire. Old roses, formal areas, wide herbaceous borders, water, secret gardens, a giant chessboard – and a wonderful nursery with unusual plants. A gardener’s paradise. A hanging golden dragon, a salamander, a sciapod, seedpods, totems, bold abstract wall pieces – I really let my imagination loose with these pieces. The materials to hand suggest an idea, and off I go…. The exhibition runs until the end of June; the gardens can be visited for free on weekdays 8.30 – 5.00. On June 28-29 the garden will be open for the benefit of McMillan Cancer services. This entry was posted in All on June 1, 2008 by Jill.